To celebrate the launch of their new book blog, '2R Awesome Reads' this lucky Form 2 class took to the library to eat cake and do some research on their next novel. 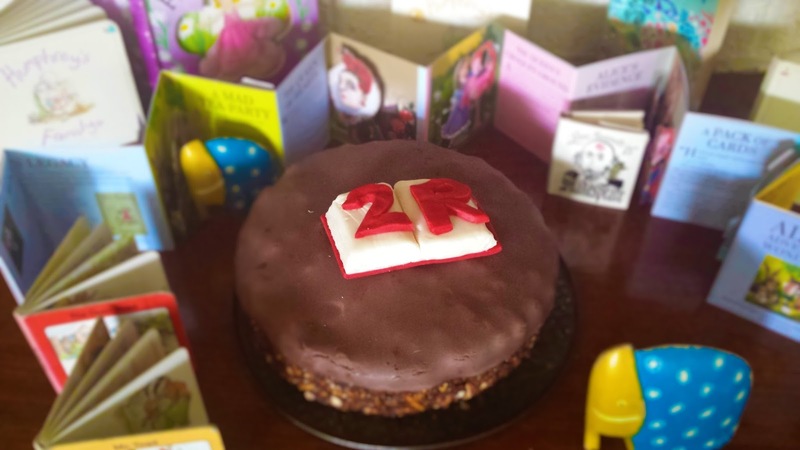 Giulia Guastalla, baker extraordinaire, kindly supplied the delicious chocolate-biscuit cake, baked using her father's own secret recipe and topped with a tasteful red and white icing book, opened and bearing the class name: 2R in red; as close as possible to The High School colours. Of course, English teacher, Ms Burrowes, school librarian, Mrs King AND Form teacher Ms Rugg were there as voluntary food tasters and gave the delicious fare a unanimous thumbs-up! Every two or three weeks, pupils in 2R read a new novel, then blog about it on their class website. So, if you are looking for a great book to read, why not check out the 2R Book Blog yourself? You are bound to find something of interest that will inspire. Their next report is due this week, so log on to their site to read their latest book reviews; more posts will follow the week after mid-term. Why not Follow what they are reading by subscribing to their page!